In an interesting development, Tiger Global has increased its stake in Amazon. The firm bought 2.44 Mn shares of Amazon Inc, taking its total holding in the $90 Bn US ecommerce giant to more than 3.19 Mn shares as of the September quarter. On the other side, personal transportation app, Ola, has raised $500 Mn in its Series F funding round. The funds will be deployed to further accelerate its growth in the Indian market with a focus on building mobility for a billion people. 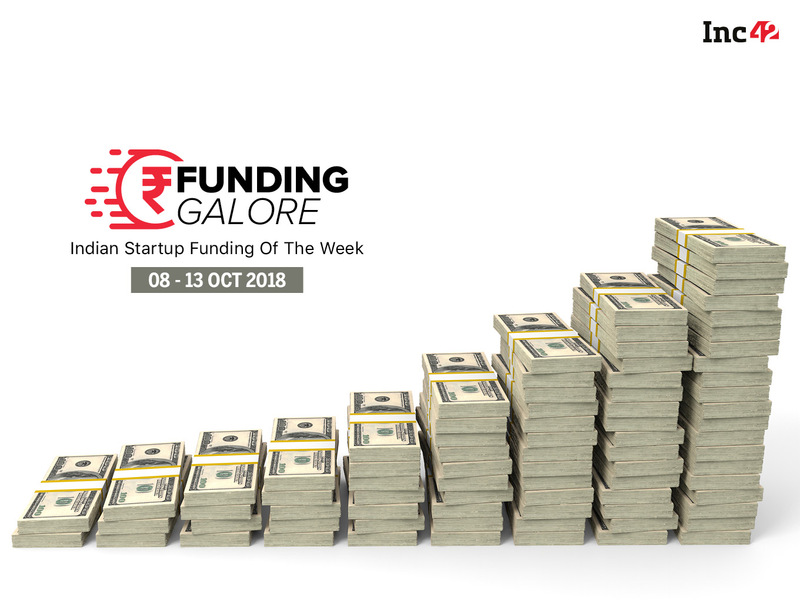 In total, this week 27 startups have secured more than $610 Mn in funding altogether. (The funding amount is based on the startups that disclosed their funding amounts). Smytten: Online discovery platform for premium products & services, Smytten, raised $200K in seed round of funding led by Rimpal Chawla and Anuj Srivastava. With this, the startup will focus on products and services in the premium beauty & grooming segment, luxury stays, high-end fitness & wellness services and consumer lifestyle products & services. ConveGenius: Edutainment startup, ConveGenius, raised about $300K in pre-series A round of funding via Enablers. The raised funding will be utilised for product enhancements and expansion of its technology & content aggregation team. Hipship: Express delivery service platform, Hipship, raised an undisclosed amount of funding from Inara Capital and Rishi Khiani. The startup plans to use the funds to further strengthen its technology backbone and expand operations across the country. Goodbox: An app that connects businesses to consumers, raised about $2.5 Mn (INR 16.51 Cr.) in Series A round of funding from Nexus Venture Partners. The startup plans to use the funds to upgrade its technology, expand operations and acquire more merchants. Styletag: Online curated fashion and lifestyle startup, Styletag, raised $7.5 Mn (INR 50 Cr.) from Jitu Virwani. The company plans to use the secured funds to expand its range of private labels, acquire a few other designer brands and further strengthen its team. Julia Computing LLC: A startup that provides training, commercial support, and consultation for those who use Julia language, raised $600K from Gordon and Betty Moore Foundation. The startup will use the funds to develop the existing beta level of language and move its core open-source computing language and libraries into its first production version over two years. Craftsvilla: Ethnic etailer Craftsvilla, raised about $34 Mn in Series C round of funding led by existing investors Sequoia India and Lightspeed. Nexus, Global Founders Capital and Apoletto also participated in this round. The raised funds will be utilised for marketing and international expansion. Taskbucks: A mobile-only tasks marketplace, Taskbucks, raised $15 Mn from Times Internet. The startup will use the funds to build more ways for companies to leverage access to its 5 Mn strong and rapidly growing user base. Renowala.com: Yet to be launched home improvement services platform, Renowala.com, raised an undisclosed amount of funding from Logtally. The startup is expected to be launched by January, 2016 with operations in Hyderabad and Bangalore. ScoopWhoop: Internet media and news startup, ScoopWhoop Media, raised $4 Mn in a funding round from Kalaari Capital. The startup will mainly use the funds to expand its video production unit, ScoopWhoop Talkies. Fourseven: An online jewellery store, Fourseven, raised around $453K in angel round of funding from Indian Angel Network (IAN). The secured funds will help the startup in expanding its team, grow its customer base, in addition to launching new products and scaling up of technology platform. PlaceofOrigin.in: Online gourmet food marketplace, PlaceofOrigin.in, raised funding from Axilor Ventures. The secured funds will be utilised to scale up PlaceofOrigin’s technology platform, operations and marketing infrastructure. SenseGiz: Known for being one of the earliest smartwatch makers in India, SenseGiz, raised $500K from KARSEMVEN. The secured funds will help the startup boost its marketing activities, foray into new product development and expand its team. UrbanClap: Mobile services marketplace, UrbanClap, raised $25 Mn in Series B round of funding led by Bessemer Venture Partners, Accel and SAIF Partners. The funds will mainly be utilised on expansion across all major cities in the country and and recruitment. AHA Taxis: Online taxi booking startup for outstation travel, AHA Taxis, raised an undisclosed amount of angel funding via ah! Ventures. The company plans to use the funds raised for technology development, marketing and operations. Truelancer: An online freelance marketplace, Truelancer, raised an undisclosed amount in seed round of funding from Blackstone Valley Group. The funds will be utilised for marketing and to expand the product for enterprise clients to help businesses & individual employers hire quality & skilled professionals. Absentia: The startup that has built a Virtual Reality Headset, Tesseract, secured above $180K in seed funding from a clutch of investors. The funds will be used for research and development, marketing, manufacturing and intellectual property rights acquisition. CashKaro: Cashback & coupons portal, CashKaro, raised about $3.7 Mn in Series A round of funding led by Kalaari Capital. The company will utilise the funds to expand globally and upgrade technology. Evobi Automations: Ed-tech startup Evobi Automations Pvt Ltd raised $530K in angel round of funding. With the raised funding, the startup looks to expand sales and launch more products. Mynewcar: An online platform for buying new car, Mynewcar, raised $250K in seed funding led by a consortium of angels from India and Europe, including Dreamz Ventures GmbH from Switzerland. With the raised funds, the company will expand to cities such as Pune, Delhi and Bangalore. It will also leverage funds to build the company’s technology platform, including mobile application and process automation. Karadi Path: Education services firm, Karadi Path Education Company Pvt Ltd, raised $2.3 Mn in Series A round of funding from Pearson Affordable Learning Fund (PALF) and Aavishkaar India II Company Ltd. With the raised capital, the company aims to reach a broader range of learners, including early childhood & college students and explore new ways to leverage technology. Medinfi: Location-based app for finding patient-reviewed clinics in the vicinity and booking doctor appointments, Medinfi, raised about $300K in an angel round of funding from a group of investors. The company will utilise the funds to launch its iOS mobile app as well as expand its operations to 10 Indian cities in coming 2-3 months. BetterPlace: The background verification startup, BetterPlace, raised an undisclosed amount of funding from Lalitesh Katragadda, the man behind Google Mapmaker. Lalitesh will join the startup as an Executive Board member. Healers At Home: Home health care service startup, Healers At Home, raised an undisclosed amount of funding from Daljit Singh, Pramath Raj Sinha, BVR Mohan Reddy and few more angel investors. The startup will use the funding to expand its team and add more services to its offerings, in order to grow tenfold in the next year. Shopsense: Digital technology company, Shopsense, raised an undisclosed amount in its seed round of funding led by Kae Capital and Kunal Bahl & Rohit Bansal. The funds will enable the startup to set up a development team and help to enhance its technology further. MindTickle: A cloud-based software that focuses on improving the sales process, MindTickle raised $12.5 Mn in its Series A round led by New Enterprise Associates. The startup will use the funds to help companies with issues related to sales teams. With this, media technology startup Amagi is planning to raise $25 Mn in Series D round of funding in the next 2 months to fuel its expansion plans. Mumbai-based chain of health centres, Talwalkars Better Value Fitness, has acquired a majority stake in Chennai-based fitness firm, Inshape Health and Fitnez, for an undisclosed amount. The acquisition will help Talwalkars to further strengthen its presence in Chennai and Tamil Nadu. Health food restaurant chain, Sattviko, acquired Call A Meal, a Jaipur-based food delivery startup, for an undisclosed amount. The acquisition will help them further strengthen delivery service. IT company Persistent Systems acquired digital content management company Akumina for an undisclosed amount. Times Internet’s startup accelerator, TLabs, has announced the list of its 8th batch of startups, which kicked-off August this year, with investments in all of them. As a part of 3rd edition of the Next Big Idea Contest, five Indian tech startups have been selected. The selected startups will receive a two-week mentorship, business development advice and valuable international experience at the Ryerson University’s, the Digital Media Zone (DMZ). Shri Ram College of Commerce has set up a first-of-its-kind incubator for students to help them establish up their own startups. Unitus Seed Fund, a seed-stage investment company, is soon going to close its second fund of $50 Mn. The first close of the second fund would be in Q1 2016 and the final close at the end of 2016. Delhi based “WE Cabs” joined the league of 6 winning Asian teams under the Singapore International Foundation’s (SIF) Young Social Entrepreneurs (YSE) programme, bagging S$20,000 in funding. Sequoia has formally registered a new investment vehicle Sequoia Capital India V with the US capital market regulator Securities and Exchange Commission (SEC) early this month to invest in India.